Generally speaking hot dogs are a guilty pleasure to have every once in awhile in summer, or else they’re a culinary choice made out of desperation when nothing else is available and you need something quick and easy to make that you can eat on the run. In rock music circles the same can be said for records like this – unappetizing junk food that seems harmless enough when placing the order but which is only going to wind up leaving you feeling slightly ill after consuming. They’re not very filling, certainly not healthy and hardly a dish that will have you eagerly going back for seconds. Amazingly this was in fact the second rendition of this song to come out in a matter of months, as Chris Powell And His Five Blue Flames released a version of Hot Dog as their debut back in June. Conceived as a novelty which attempted to soft-peddle the rock elements to not offend the blue-bloods of Columbia Records while still theoretically appealing to those who actually liked the music it was a conceptual misfire even as the group managed to pull it off with relative class. Hardly a ringing endorsement for putting out a cover version by another group who were not above having their own rock membership credentials questioned. The question of course is whether The Ray-O-Vacs themselves were altogether aware of their need to beef up their image at this point. They were coming off back to back hits, including a Top Ten national hit with their debut, I’ll Always Be In Love With You, and so for all we know they might’ve been convinced they were on their way to eternal fame and glory. That record however, while exceedingly well done, wasn’t on the vanguard of ANY musical style, let alone one as forward looking as rock, and it could be argued that its success had as much to do with being covered by a rival faction dubbed The X-Rays on the far better distributed and promoted Savoy Records, thereby helping to publicize The Ray-O-Vacs original in the bargain. When their follow up, Happy Am I, hit the regional charts around their home territory of New York and New Jersey (as well as briefly scoring in Florida) in the spring it must’ve seemed like validation for the group. Proof that they hadn’t just gotten lucky the first time out with a new approach for an old song. But if they were thinking of stopping off for a celebratory dinner they wandered into the wrong restaurant for a Hot Dog. Normally we might say that tackling something off the beaten path wasn’t a bad move to make when it came to B-side material. We’ve preached often enough around here about the need to diversify your sound to keep from growing stale as well as to potentially broader your audience by appealing to different factions and in the singles era that meant making full use of the B-side of records to indulge in such experiments. 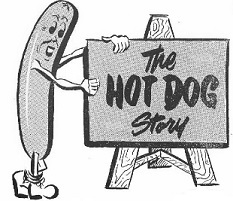 The problem is Hot Dog wasn’t the B-side of Coleman 112, it was the A-side. The song seen as having hit potential. The side with which you were stating your case as artists. Your musical manifesto as it were. Frankly it’d be hard to conceive of a worse choice to make at a time when the rock universe was busy consolidating their commercial gains with even more aggressive records while at the same time the realm of staid black pop music that this group might otherwise explore was becoming a much less fertile ground for producing hits. Instead of serving up a five course meal, or even just a well made entrée they were instead handing you processed leftovers that traditionally were hawked from the street. In case you were wondering that description fits both the food itself and the record. But just as the food with this name can be cooked in a variety of ways (grilled, boiled, steamed) so too can this composition be approached differently depending on your aims. The Five Blue Flames handled it in a sly manner, singing about it as if they were either completely addicted to the nitrate-addled delicacy or if they were exaggerating its appeal in a dead-pan manner for added comic effect. It worked well in that way, their harmony singing was very seductive even if what they were singing about was completely ridiculous. 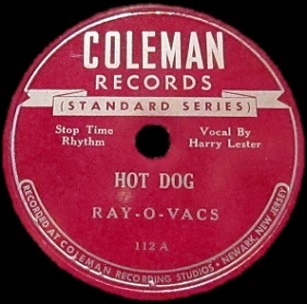 The Ray-O-Vacs take a far different approach, starting off with it firmly in a novelty vein, as following a folksy bass-led intro the group chants the song’s name in rhythmic succession over which Harry Lester’s lead comes across as half-embarrassed over the content he’s forced to sing. Why wouldn’t he be? Waxing poetic about eating twelve of these things isn’t exactly something you can come off looking good doing. The Ray-O-Vacs were never the most flamboyant musical group, the kind of musicians who would go all out to impress you with their chops, but they were always efficient in their playing, modest in skill perhaps yet consistently classy in what they tried. Chink Kinney is their featured soloist on sax and while he could never compete with the best on that instrument he was usually more than competent. On Hot Dog however he sounds like a drunken moose. His backing lines behind Lester’s vocals aren’t offensive, just basic embellishments to the melody, but when he steps into the spotlight he falls apart completely. If a horn could have indigestion from eating too much of these culinary rejects then this is how it would sound. Notes are hit and miss, melody is but a vague rumor and any passion – or even moderate effort – is nowhere to be found. Yet I’ll still say it’s not the worst aspect of the accompaniment. Not when Joe Crump plays the piano as if he’s unaware it’s no longer the 19th century. 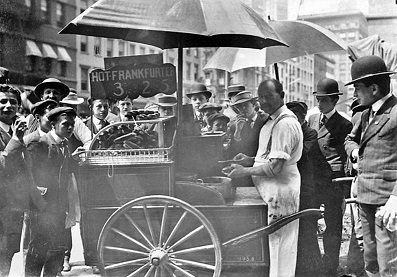 I realize hot dogs caught on in the 1800’s when Charles Feltman popularized them in New York, but Crump didn’t have to travel back to that era in his playing to authenticate this for listeners. In more than 375 records we’ve covered to date this wins the award for most inappropriate musical interlude hands down and I hope for the sake of our sanity nothing even worse will be challenging it any time soon. When the vocals return, as simplistic and underwhelming as it is, the record improves just by comparison. Their second attempt at sounding enthused during the soda-themed bridge is even more raucous than the first time around as they desperately try livening this up by calling out for something to wash this garbage down with, but unless it’s cyanide there’s no drink on earth that’s strong enough to be able to to put you out of your misery after hearing this. It’s safe to say that no matter how starved you were for music – or for lunch – Hot Dog is something all but the most non-discerning customers would pass on. I realize that not all records have to have serious intent, that there’s something to be said for lighthearted fun and even outright silliness at times. If that was what they were hoping to achieve here I might cut this some slack. Chris Powell And The Five Blue Flames after all had managed to redeem the song to some extent with excellent singing and a decent arrangement. They couldn’t turn hot dogs into sirloin steak but at least they didn’t give you an upset stomach if you were forced to consume what they were serving up. The Ray-O-Vacs however steer clear of taking this seriously enough to play with any real commitment or pride in their musicianship, yet they seem far too self-conscious to turn it into an outright farce. The odd thing is the sung melody, as inane as the words are to sing along to, remains moderately appealing even in this dreadful rendition. I suppose it’s often that way with hot dogs, the smell of them cooking might lure you in but by the third bite you wished you’d made a tuna fish sandwich for lunch instead and walked by the hot dog stand on the corner without breaking stride. Leave a reply on "The Ray-O-Vacs: “Hot Dog”"